For classroom, you can facilitate a 1.5 day, three 4-hour session, or a condensed 8 hour workshop. There 2 supporting online modules can be blended or used to reinforce the learning: Preview the workbook for this course immediately! Frequently, the direct cost of acquiring a new customer exceeds the cost of retaining existing customers. But almost always, the benefits that existing customers bring to your organization far outweigh those of new customers. How do you ensure that your organization capitalizes on the benefits of keeping your current customers? Providing exceptional customer service can not only help you keep your existing customers, but also win new clients through positive reviews and recommendations from satisfied customers. 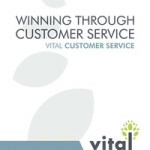 The lifetime value to your organization of a customer who is satisfied with the service they receive can be tremendous. When customer service representatives understand their role in the customer relationship, they will keep customers happy and returning. 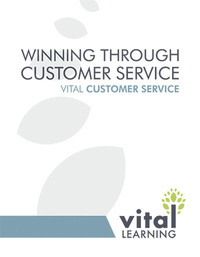 The Vital Learning Winning Through Customer Service™ course uses a variety of interactive training methods to target the skills, behaviors, and attitudes that have the greatest influence on understanding the customer and providing solutions. In addition, the course helps customer service representatives identify the essential behavior/communication styles that will help them understand their customers’ individual styles and needs.